This movie is classic and a true example of that nightmarish quality of horror movies that I love oh so much. Mary Henry and her friends drag race a car of boys. Things go horribly wrong however when their car takes a little detour off of a rickety bridge crashing into the muddy waters below. Rescue men cannot find the car- but Mary soon stumbles up the bank looking dazed and cannot recall what happened. We then follow Mary to her new job as a church organist. While driving to her new town a scary man appears outside the car window...! I don't know what it is about this guy but he just freaks me out. 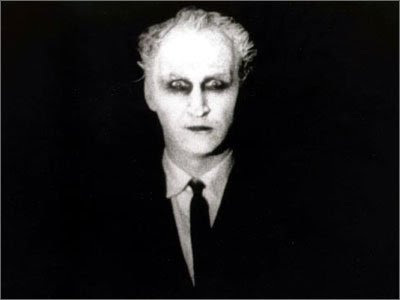 He has this terrible makeup on- you know stereotypical dead people dark circles but it totally works. I think it freaked me out because I used to have nightmares about riding in the back of my parents car and a vampire swooping up next to us. Yes that's definitely where my fear stems from. Anyways this dude is relentless. He pops up everywhere- outside of Mary's bedroom window in her living quarters and every single time he produces the same feeling of terror. Pretty impressive when you think about it. Then there's the scary organ music. I don't know what it is about organs either but it really sets a scary tone. It's so classically menacing! Then there's the way that the dead people move around. Ugggh I've already spoken about how creepy silent movies are so when these dead people are dancing in that creepy slow kind of way and at the end when they are all chasing her! Yikes it was really unexpected. Overall a true gem that definitely set the stage for movies like Jacobs Ladder and the Sixth Sense. What a treat what a treat. Nice review. 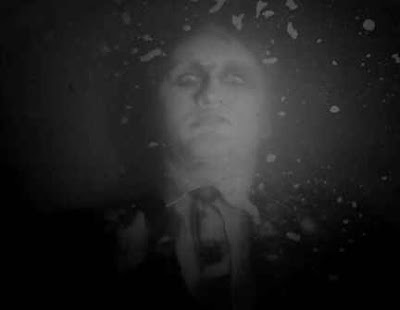 "Carnival of Souls" is one of my favorites; I watch it every Halloween. It is Herk Harvey's little low-budget masterpiece and a cult classic. The Kiss: Now That Is One Cat I WOULD Kill. Martyrs: I Got Nothing Witty To Say. The Wicker Man: Boobies, Boobies Everywhere. Grace: I'm Never Breast Feeding. Baby Blues: Reason Number 501 Not To Have Kids. The Fly: I Want Fly Mittens For Christmas.